When you book an airport transfer with us, you will be met at the airport by our corteous staff and offered a polite welcome. 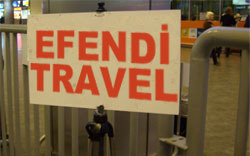 Please walk towards left side direction when you come out of the arrival hall and watch for our sign written in red "EFENDI TRAVEL" and standing on a tripod. You will be helped by our colleagues with your bags to our vehicles waiting for you outside and directly transferred to your lodging. You can travel between Istanbul's New Airport or Sabiha Gokcen Airport and Istanbul hotel areas such as Sultanahmet, Sirkeci, Beyazit, Laleli, Taksim or Besiktas by Metro and tram, taxi, or private transfer. 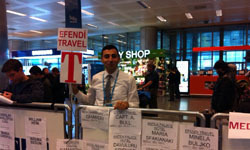 Efendi Travel provides 24 hrs running airport transfer service between Istanbul hotels and Istanbul Airports in the most convenient, easy, comfortable way with the most reasonable price. Then, your luggage will be loaded into the car and you will be transferred from Ataturk airport to your lodging in Istanbul by a private air-conditioned van. Please note that most of taxis in Istanbul without air-condition and public transports are mostly pretty crowded during the day. 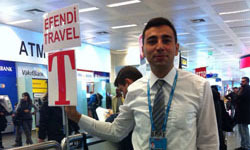 Efendi Travel airport transfer service provides the easiest, most comfortable, on time and best value for money airport transfer service in Istanbul. There is no hidden cost in our prices and you can pay directly to the driver. If you would like to transport between 2 airports of Istanbul, either from Istanbul New Airport to Sabiha Gokcen airport or on the reverse direction, Efendi Travel offer the best price and service. Please note that there is no non-stop public transfer service and taxi fees are obscure due to the traffic conditions or the reliability of the taxi drivers. If you are travelling with a group and need a reasonable price to transport from Sabiha Gokcen airport or Istanbul New Airport to the Istanbul hotels, please contact with us to get the best deal for Istanbul airport group transfer ! Estamos encantados de ayudarle en sus preguntas o cualquier información. Nuestra empresa está abierta las 24 horas del día, 7 días a la semana, incluyendo los días festivos nacionales y religiosas. Le informamos de que respondemos a las preguntas dentro de las 24 horas, si no tiene noticias de nosotros dentro de 24 horas, por favor revise su carpeta de correo no deseado.